When we were travelling in Ilocos what appeals me most other than the sites and view is the food. I flew here setting my mind that I should taste the original dishes that Ilocano has. In our first and second day in Laoag, being accommodated in our tour guide's house, Kuya Glenn indulge us with the introduction to their local cuisines. Her wife serves us home-made longganisa and embotido. Stir fried and stewed fresh vegies were also served. For those times that we were out for our tour, we ate in restaurants that specialize in local delicacies and there we tasted their Pinakbet, Dinuguan, Bagnet and the peculiar pizza of Herencia. Arriving in Vigan also made me excited that I can finally taste the yummy Vigan Longganisa right from where it originated. In Lilong and Lilang’s Café we tasted their famous empanada (stuffed with egg, longganisa and vegetables) and ukoy which is from my opinion is not for merrienda but instead a food good enough for a meal. On our last day in Vigan, I was talking to one of the hotel staff about the story of Villa Angela and the family pictures inside when we suddenly shifted the topic to the longganisa that they are serving. I expressed my interest of seeing how it is being done. So kind of the hotel staff that he directed me to one of the well-known makers of famous Ilocano pork dishes - Longganisa, Bagnet and Chicharon (Okilas). She says that we can go there anytime since it is only a couple of blocks away from Villa Angela. She mentioned that we have to look for Manang Ida (hindi si Lorna o Fe – the staff joked). The next morning we headed to the said house which is an 8 minute or less walk from the Villa. We are accommodated by a guy who I guessed as Manang Ida’s nephew; he introduces us to her and ask us if we are student creating thesis or a documentary. We answered neither – “we are just curios tourist” and they happily showed us the process that this dishes went before landing our plates. Here are some workers, filling pork’s small intestine with a mixture of meat and fat combined to crushed garlic, sugarcane vinegar, soy sauce and atsuete making Vigan Longganisa. On the other side is huge pan boiling on top of a traditional wood fire cement oven, it is where the pork (kasim) is being fried using its own oil in 2-3 hours to soften. Afterward, once the pork is cooked, the oil is removed from the pan and the pork is settled in few minutes before they deep fry it again to achieve its double-fried crispiness. I remember this process being done by my grandpa (minus the big chops and long hours of frying) in a Bisayan dish called “nilinsan” both has incredibly good taste! On the top of the boiling pans are some pork skin hanging nearing to be dried. I don’t have any Idea on what is this until one of the man who manage the deep frying of bagnet pointed and noticed my wondering, he mentioned that it is going to be made as a chicharon skin on which they call it as Okilas. 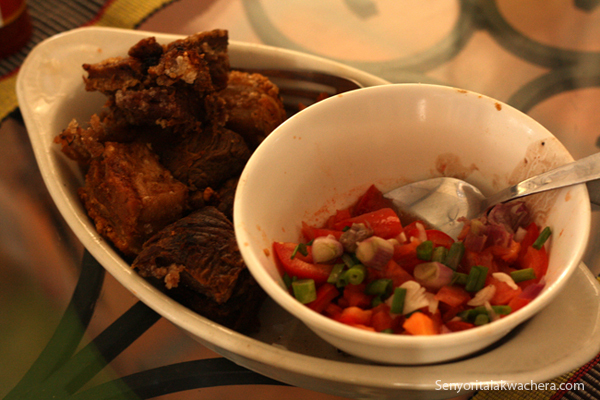 This chicharon skin is usually used in cooking their Dinuguan. Ahuh! Come and visit again Steph :) then I hope you can invite me! haha Cheers! 1. Need for a tour guide? You blog will be a good help. Will be back to read more. Good luck to your Ilocos trip and enjoy!!! Hi, Sorry i wasn't able to update you with the number. I can't get it because my contact in Vigan changed her number. I mean - I can 't contact them anymore.